Love them or be annoyed by them, there's no denying the lasting pop culture status of TV's biggest blended family. 1971 Topps Brady Bunch trading cards capture the cheesy spirit of the classic sitcom. The 88-card set features a mix of shots from the show and promotional shots. Some offer single-shot recaps while others highlight the show's various actors and characters. 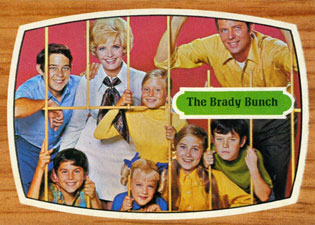 1971 Topps Brady Bunch card fronts mimic the look of a console TV set. Arranged horizontally, images are held within an oval border. They have a thin white frame that gives way to a wood grain border. A small green ribbon has a short caption. Card backs work together to form puzzles. Some also have short captions. Although the copyright states 1969, the cards were released two years later. In 1970, Topps produced a Brady Bunch test issue. There are only 55 cards in this set. The easiest way to tell the 1971 Topps Brady Bunch set from the test set is on the back. 1971 cards encourage collectors to put together an 88-card set. The line is changed to 55 cards for the test issue. 1971 Topps Brady Bunch # 28 Sometimes I Hate Ice Cream! Rare vintage card set! 1971 Topps Brady Bunch # 54 Someday Let's Eat Alone! rare vintage card set! 1971 Topps Brady Bunch # 50 A Boy's Room Is His Castle Rare vintage card set! 1971 Topps Brady Bunch # 18 Big Noise! rare vintage test card from set! LOOK! 1971 Topps Brady Bunch # 23 Long Distance Phone Call! Rare vintage card set! 16 Break It Up! It's Bedtime! 38 Who Used My Toothbrush? 52 Where's My Greasy Kid Stuff? 64 Can I Keep the Bird? I am looking for a 1971 Brady Bunch Card # 25. If you ever come across one, can you e-mail me please ? I have over 100 Brady Bunch Collector Cards – will have to double check on the year. They are all looking for a good home. Anyone interested, email me at donaldfreund@bellsouth.net.